My home in France is an old 'Fermette.' It was once a very small farmhouse built of stone with a slate roof. 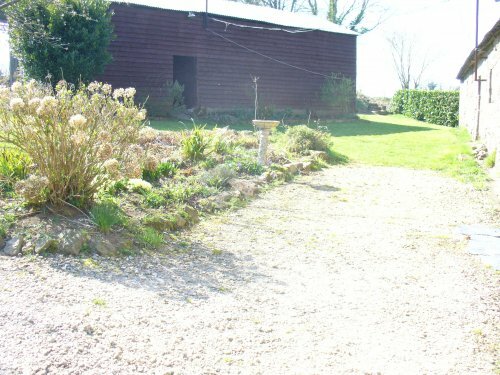 It is quietly situated in an area of outstanding natural beauty. Close to the Nantes Brest Canal it is ideal for someone wanting to 'get away from it all,' for cycling, walking, fishing, canoeing, bird watching and experiencing French rural life. Horses, bicycles and canoes can be hired locally. The small town of Glomel is about 2 kilometres and the market town of Rostrenen is about 6 kilometres. There is a small terrace outside the house overlooking the garden and plenty of garden furniture plus both gas and charcoal barbecues. There are bicycles in the barn, although they aren't at all 'smart' and not intended for the serious cyclist, we use them for getting bread and croissantes for breakfast. More inforrmation about the house can be seen on the Holiday Lettings UK web site, www.holidaylettings.co.uk, property reference 86598 where there is also a selection of internal and external phots. This is French rural at its' most rural! It's very quiet. The hamlet of Porz en Caz is down a one track road that is a 'cul de sac.' There is only one other house occupied all year round (about 800 metres further along the road. Our next door neighbour lives in Paris and usually visits only in July and August. Although small, nearby Glomel is a lively town with regular 'fest noz' in the village hall. There is a large lake which is a haven for wildlife and birds, it also has an artificial beach at one end. Tourism is not a large part of the local economy although there are many interesting places to visit. e.g. the Lac de Guerledan is about the size of Windermere and has a wealth of water sports, the Abbaye de Bon Repose is steeped in local history. There are also ancient Standing Stones in a huge circle, the house is on the Route de la Pierre (route of the standing stones. The nearest is in Glomel. There are some lovely places to eat traditional French food at very reasonable prices and, despite being in rural France, there is a good English community and, for those who would like it, there is the opportunity to take part in some of the activities organised by our Breton/English Integration Club. I am a 66 year old semi retired professional woman who has previously had experience of house sitting for people with pets (dogs and horses) in France, the UK and Melbourne. I have never done house swops before. I will undertake to keep your home clean and tidy and to look after it carefully for you. I have been house sitting in Melbourne (Ferntree Gully) from 1st December and am returning home shortly. I would like to come back fairly soon as I have discovered new members of my family and would like to look them up. I need to be back in France from the 2nd week in June at the latest as I have work commitments there for the summer. As I also have a holiday home in Suffolk, England I will be happy for someone to visit both houses if they would like to see a bit of both countries. I am happy to look after your pets and have experience with dogs, horses and sheep. I have 3 outdoor cats (2 are strays and too shy to get close to) the other I have looked after since his owner, next door, died and the cat refused to be moved. None come in to the house. There is a barn and an old house used for storage that they make themselves comfortable in. When I am away a friend usually calls to feed them. I know that people whose houses and pets I have cared for in the past will be happy to provide a reference should it be needed.